Caesar’s Palace is one of the most recognized names of any casino in the world, let alone Las Vegas, and with good reason. Situated in the centre of the Strip, Caesar’s Palace is simply vast, and has so many jaw dropping sights, you have to visit it even if you don’t spend a dime. Just listing the things Caesar’s offers doesn’t do it justice, though – sure it has 120 shops, 3,300 hotel rooms, a 4,100 seat stadium modelled on the Colosseum and live entertainers from Celine Dion to Elton John – but it’s the way Caesar’s is presented in such a lavish, detailed, and, dare one say it, mad style that truly makes it one of the top places to visit in Vegas. 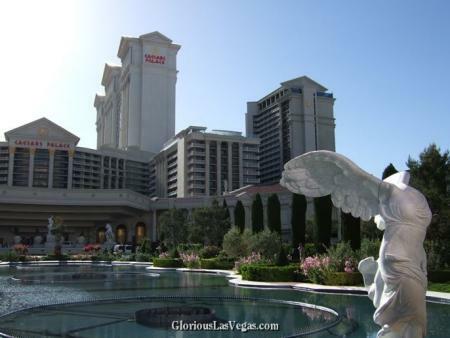 Read on to see the complete Caesar’s Palace review. When I first went to Vegas, I couldn’t wait to check out Caesar’s. I had no idea what it was like, of course, I’d just heard so much about it before I went that I wanted to see what all the fuss was about. If any casino epitomized Vegas, for me it was Caesar’s. Well, I was stunned with what I found. I was expecting a reasonably big down and dirty casino with a lot of cheese and maybe a bit of Elvis thrown in. Maybe in the 70s, perhaps, but not now! Sprawling over 85 acres of prime Las Vegas real estate in the centre of the Strip, Caesar’s Palace is simply huge, and can be completely disorienting when you first enter. Not only is the interior huge, but it’s so sprawling, it can be difficult to know exactly where you are, and certainly which way out is! None of this matters, though, for you’ll be so gobsmacked by what you see, you won’t care where you are! Let’s start with the Forum Shops. 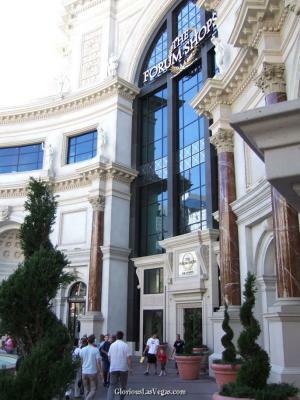 As you walk up the strip from the North, the first thing you come across at Caesar’s is a gigantic heavily-detailed facade with marble columns, arches and a huge sign proudly proclaiming The Forum Shops (see pic, above). Interestingly, though, this isn’t the entrance – it’s just a shop window! The actual entrance is round the corner, and it’s even bigger and more impressive (see pic, left). It’s not until you go in, though, that you realise why the entrance is so huge – it opens onto what must be the most lavish, glorious shopping mall entrance you’ll ever see. In Caesar’s own words, it’s “a grand pedestrian plaza [that] creates a signature entrance for The Forum Shops at Caesars.” Signature is certainly the word for it! 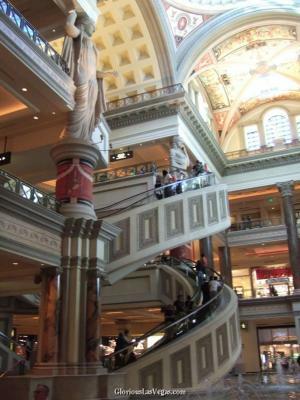 In the centre is a huge winding escalator (below) that winds its way up the various levels of the mall, flanked by gigantic statues of Roman Gods. Beneath is a beautiful water feature, while high above is a stunning domed ceiling. The glorious opulence, lavish detail and sheer over the top nature of the place will take your breath away – and this is just the entrance! Surrounding the central escalator are a series of shops, but it’s not until you go inside the main mall that the rest of the 120 shops are on display. Be warned, though – the shops cover some 634,000 square feet, and with the ever-present fake sky painted onto the ceiling (a feature in virtually all Vegas hotels), and the lighting set low, you can start to feel a little disoriented, particularly if jet lag’s just kicking in! As you delve deeper into the mall, you’ll come across one or two little features that all add to the bonkers magic. Like the giant wooden horse of Troy that suddenly appears, which is actually just part of a toy shop inside! Or the stunning statues in the middle that at least help you to get your bearings when you’re completely lost. Best of all though is the Talking Statues at the far end of the mall (below). This is a recreation of the legend of Atlantis (well, Caesar’s version of it anyway! ), with two huge statues that vividly come to life every half an hour in an animatronics extravaganza. 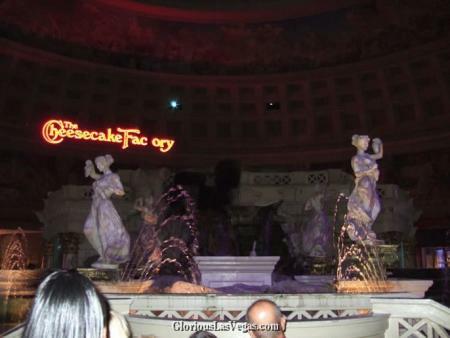 Complete with fire and water, the whole show is a must-see, as is the Cheesecake Factory behind the statues, which sells every variant of cheesecake known to man (well, 33 variants anyway)! From Harry Winston to Jimmy Choo, Burberry to Boss and even Diesel, Victoria’s Secret and Ted Baker thrown in for good measure, there’s a huge range of shops on offer – there’s even the Exotic Cars area, where you can drool over Ferarris, Aston Martins and Porsches. Trust me, if you’re bored in Vegas (really?! ), lose yourself in the Forum Shops…literally! Oh, and if you get hungry, which you will do, as your body clock will be all over the place and you’ll get so lost it’ll feel like days since you last saw daylight, there are also over 13 restaurants and speciality food stores spread around the mall as well. One of the great things about Las Vegas is that the hotels in which you stay have become the main attractions in their own right. Unlike other resorts, where it’s the beautiful beaches or stunning scenery around which the hotels are built, in Vegas it’s the hotels themselves that every hotel tries to provide a view of. 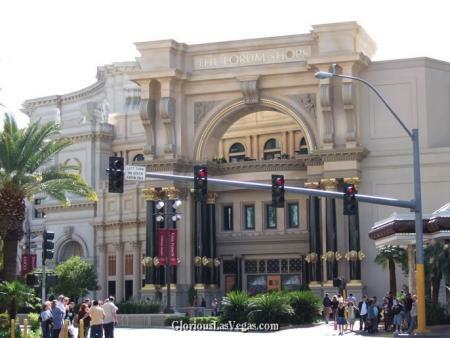 This makes Las Vegas the most narcissistic tourist resort in the world! So what about Caesar’s Palace, then? How does the Caesar’s Palace building compare with its fabulous neighbours? Well, not all that well. Oh don’t get me wrong, it’s huge and majestic in a suitably Roman kind of way, and the Forum Shops and Colosseum are extremely impressive. Equally, the two hotel towers are also extremely impressive, and dominate skyline in an imperious way (they’ll also be joined by a third tower in 2009 as well), while the famous Caesar’s Palace fountains do add a bit of colour to the place. 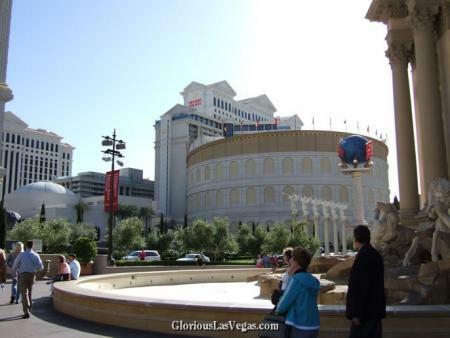 It’s just that, compared to the Bellagio, with its huge pool, the glorious Paris Hotel opposite, or even the Mirage just up the road, Caesar’s Palace is a bit too…well, bland! The detailing is impressive, and the sheer size of the place takes your breath away. There’s just too much concrete everywhere and not enough colour, making the whole place seem like an enormous project that was never quite finished. There’s also a mess of electricity pylons on the front, which adds to the feeling that most of the work was done to the inside, and the outside aesthetics were kind of forgotten about. This is a shame as it’s such a huge hotel, and such great fun inside, you feel it doesn’t do itself justice from the outside. 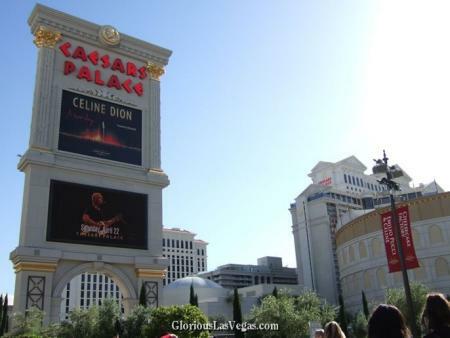 Fortunately, you can sit on its terraces, grab a beer and look at the other hotels, such as Paris and the Bellagio, safely immersed in the concrete jungle of Caesar’s, which is much better than sitting outside at Paris, say, and having to look across the way at Caesar’s! I’ve not stayed at Caesar’s, so I’ve no idea what the rooms are like, so the best thing is to check out the following reviews from across the Web. They also note that it’s easy to get lost in the place, though! Of course, this is deliberate, as if you can’t find your way out the casino, you might as well stay there and keep on gambling! They also give a good detailed summary of the facilities on offer at Caesar’s. So there you have it – Caesar’s Palace in all its glory. If you go to Las Vegas, you have to visit Caesar’s Palace for the true Vegas feel. The rest of Vegas may be going upmarket, but Caesar’s will never lose its camp, over the top feel, and is exactly the antidote that’s needed to all the new hotels that are sprouting up that seem to be taking themselves far too seriously! Caesar’s Palace is like no other hotel on the planet (and that’s saying something given its immediate neighbours! ), and you have to visit it simply to see what true decadence on a massively camp scale is really like. Fun, kitsch, fascinating and gloriously grand in equal measure, Las Vegas’s Caesar’s Palace will put a huge smile on your face. Just make sure you take a map and a compass with you! 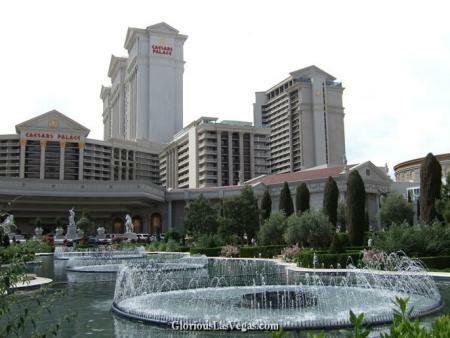 If you want to see more of the place, check out our new Caesar’s Palace photo gallery.